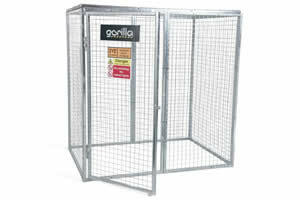 Here at Armorgard, November 1st is the launch date for our new design Gorilla Gas Cage. Keeping ourselves and your product range ahead of the industry, we are introducing a unique range of cylinder storage cages, by altering our current bolt-together Gorilla Gas Cage range to become modular and galvanised. As standard, these cages are available in 8 sizes, however, because of their modular design, we can supply the cages to any size you require! Also, by switching the finish from powder coat to galvanise we have increased their durability by 50%. Modular system – make your own size gas cage! The Gorilla Gas Cage range is supplied flat pack, comes complete with all the relevant fixings and is a bolt together style, making it quick and easy to erect. Also supplied, is an instruction manual to assist in making up the cages. Recently, Health and safety have intensified their concern on the storage of gas cylinders. This is because, the consequences of a cylinder exploding when it’s not stored properly are phenomenal and have taken lives. Therefore, as winter draws in, the use of gas increases and with that, so does the demand for gas storage. 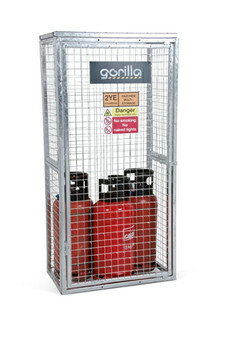 With a unique range of gas cages being introduced to the market, now is an excellent time for you to take advantage of the Gorilla Gas Cage range which Armorgard has to offer – the window of opportune sales is wide open! The £340 million London Wall Project has commenced by the contractor Brookfield Multiplex. Work has begun demolishing the 17-storey, 1960’s office block, namely St Alphage House, to make. In recent weeks, the government has given the final ‘green light’ for Hinkley Point to become the home of Britain’s first nuclear power station for a generation. The energy giants EDF,.